Thanks for your interest in contributing to Rock Climbing Women. We’re constantly looking for new stories, writers, and inspiration to share with readers. Our regular content includes gear reviews, routes, Q&As, climbing news and tips (with a heavy emphasis on women-specific challenges). You can review examples of these types of posts to get an idea of what we’re looking for. In addition to our columns, monthly features allow contributors to share personal stories that fit a theme. We will start collecting submissions in advance, so check back often to see if we’ve posted a new theme. Each theme will be introduced on the blog to give you some ideas of what to write about. Feature submissions can come in any shape or form, from casual essays (think everyday blog posts – lots of words, a few photos) to photos with captions (lots of photos, a few words – your iPhone photos work great!) to collaborative Q&As (have a group of climbing friends with the kind of story best told by all of you? Let’s do an interview!). In writing as in life, the only limit is your imagination. Send us a few thoughts on what you want to contribute. Whether you’re inspired by a current or past monthly theme, want to share a destination, or took some photos at your latest ladies night, fill out the form below with any relevant information. It doesn’t have to be your post – let’s start with the details. We’ll get back to you ASAP with how to proceed. We want this to be a highly collaborative site. It doesn’t work if we don’t inspire new people to add to the conversation. We have this thing in common: We love climbing. So let’s be friends! 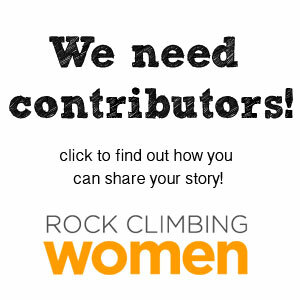 Contribute regularly, and we’ll be the go-to source for rock climbing women. Do you blog? Use Instagram or Twitter? We’ll make sure to link to whatever sites help people connect best with you. Contributors who offer regular content will get their photo and bio added to our about page. For now, all contributions are voluntary, but we hope to change that in the future. If you want to contribute to contributors, be sure to share the site, read often, join the conversation (through comments or posts), and, if you buy gear at any of our affiliates, go to them through us. Questions? Feel free to contact us about anything.